Yaremche region is situated in the southwestern part of Ivano-Frankivsk Oblast, occupying the central part of the Ukrainian Carpathians, within the mountainous region of Gorgany, Pokuttia-Bukovyna Carpathians and Chornohora. Near the town of Yaremche, there are six towns and villages: Vorokhta, Tatariv, Mykulychyn, Yablunytsia, Voronenko and Polianytsia. Natural and climatic conditions exist for the creation and realization of pleasant recreation. Tourism is convenient here, since the region is connected with all Oblast centers of Western Ukraine and also with Kyiv through railway and motor services. This territory is interesting and appealing for various kinds of tourists – for those who are environmentally aware and as well as for others, also for those who are not limited by budget concerns or for those who are on a low budget. Some tourists choose to travel on their own and sleep in tents, while others prefer travelling with a guide and staying overnight in private houses or tourist complexes. The choice depends on the comparative accessibility of high mountain pastures and ridges, the inaccessibility of rocky Gorgany and the absence or presence of marked routes on the chosen territory. For tourists, the attractiveness of the area lies in the fact that there is a variety of nature reserves and accessible forests. Almost half of the territory of Yaremche Town Council is situated within the Carpathian National Natural Park (CNNP) which is the first park in Ukraine that is of national significance and belongs to the Nature Reserve Fund of Ukraine. 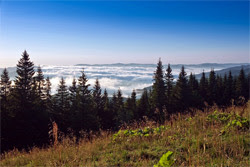 The Western Gorganian neighbor of the park is Gorgany Nature Reserve, a part of the Eastern slopes of the Pokuttia-Bukovyna Mountains and is on the National Park Hutsulshchyna; while the southern Chornohora neighbor is the Carpathian Biosphere Reserve which is situated in the Rakhiv District of Zakarpattia Oblast. Yaremche, Tatariv and Vorokhta are surrounded by conifer forests (Spruce, European Pine, Pine Tree, and Juniper). Ethers of conifers combined with the smell of herbage plants enrich the environment with phytoncides. Phytoncides are compounds derived from plants which kill bacteria and fungi. The most active in producing phytoncides is Larch, which is followed by Silver-Fir, Pine, Cedar, Fir, and Birch. Clear mountain air rich in oxygen and ozone regulates the body’s immune system and has a therapeutic effect on diseased or weakened organs of a person. The scientists claim that conifer trees, especially Spruce, create the sense of freedom, while landscape therapy is an important aspect of treatment. According to the Forest Code of Ukraine, forests by their role and location perform mainly ecological (water protection, protective, sanitary and hygienic, therapeutic, recreational), esthetic, educational etc. functions and have limited exploitation. Thus, our legislation declares the preference of ecological and esthetic functions of forests over the commercial. According to ecological and commercial significance, forests are divided into two groups. – forests on the territory of the Nature Reserve Fund (nature reserves, national natural parks, natural monuments, protected natural sites, regional landscape parks, forests of scientific or historical value, etc.). 2. Forests of both Ecological and Exploitation Significance – in order to preserve their protective functions the mode of limited forest exploitation has been established. The forests of the first and second groups might contain particularly protected land plots of forest resources with limited exploitation. There are two types of using forest resources – general and special. Special types of using forest resources include wood procurement during felling for primary use, procurement for soft resins, secondary timber, (stub, bast, bark, forest greenery etc.) and collateral forest uses. Special usage of forest resources is done with special permission – according to wood chopping permit (order) or forest usage permit. Citizens are allowed to stay in forests without restrictions, collect wild herbs, flowers, berries, nuts, other fruits, mushrooms etc. for personal use, free of charge, unless otherwise provided by law. There are other rules in effect on the Nature Reserve Fund of Ukraine, as well as on other nature territories and sites of particular ecological, scientific, esthetic, commercial, historical and cultural value. Such territories are created with the aim of preserving the natural diversity of landscapes, genetic conservation of fauna and flora, maintaining general ecological balance and providing environmental monitoring. Any activity which has or may have a negative impact on them or hinders their designated exploitation is forbidden. Commercial exploitation of these territories as well as procurement of wood, medical and other precious plants, their fruits and hay, cattle grazing, hunting, fishing etc. may be allowed on condition that such activities comply with the designated usage of the territories. The research of territories and sites of the Nature Reserve Fund or other usage is possible only on condition of observing the demands of their reserve status. This edition emphasizes three Natural Reserve features that are managed by special administrations, created for this purpose, which are responsible for maintaining their reserve status. These are Gorgany Nature Reserve, Carpathian National Natural Park and Carpathian Biosphere Reserve which are environmental and research institutions of national significance. State protection service which has the status of a law-enforcement body is responsible for these protected areas. In the recreational zones of Carpathian National Natural Park and in the zone of anthropogenic landscapes of Carpathian Biosphere Reserve there is a network of ecological tours which include the most interesting and beautiful protected areas where there is a large number of outstanding natural, cultural and historical sites.